Beg, Borrow and Great Deals! Welcome back to Money Saving Mondays! This week is entirely inspired by a quote I found: “If you don’t own it, see if you can borrow it. If you can’t borrow it, see if you can make it. If you can’t make it, rent it.” (1,001 Ways…Dazzling Wedding, S. Naylor) This applies to absolutely every wedding at every budget! There are many avenues to saving money on your budget that brides overlook; but not anymore! Have fun with your wedding and make it a treasure hunt on a daily basis for good deals and unique touches. 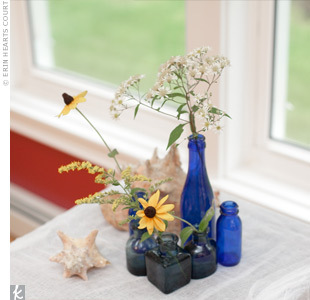 Garage sales are a great way to find steals on vases, candle holders and more. I found a set of 100 votive holders, in perfect shape, for $6.00! Don’t be afraid to buy things that are not a perfect match either. Guests love individual touches, centerpieces being just a little different from another adds a modern flare straying away from the traditional uniformity. I saw a beautiful example of this at Anna and Theo’s wedding last Saturday at Plymouth Creek. A friend of hers used treated pieces of wood in her centerpieces. Anna asked to borrow them and presto! Anna and Theo’s centerpieces were some of the most unique and elegant ones that I have seen! Her money saving techniques didn’t stop there…She used Donato’s Direct and got all of her decorative floral at wholesale prices! A few things that most people own and forget to utilize on the day of their wedding include: white Christmas lights, pictures from home (photographs of other family members weddings can make for a fun heritage table), items you have acquired from vacations (great when you have a theme) and more. Looking around the house and the homes of your family are a great start to saving money. 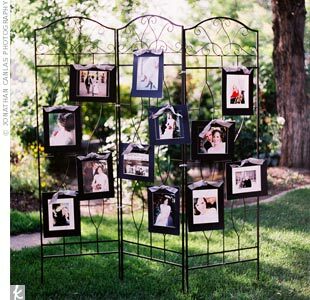 Not only is it more cost effective but it can make a family member feel like they have a special part in your big day. The lesson this week is all about utilizing the things around the house and the family and friends around you. Borrowing and making unique touches gives a great personal flare to any wedding. Remember, every bride deserves her dream wedding at her dream budget! Happy Planning!